but did you know we can do so much more? And....Face Painting at the Beach or Pool? Yup! I am SUPER EXCITED to let you know that a brand new line of water resistant paints has been created with pool parties in mind! Notice the cute leg swirl design in the picture above? That's done in black & white "tattoo-style" using the new water resistant paints. Splash it, swim in it, dry off with a towel... it comes off with soft soap, but won't smear or run with water. 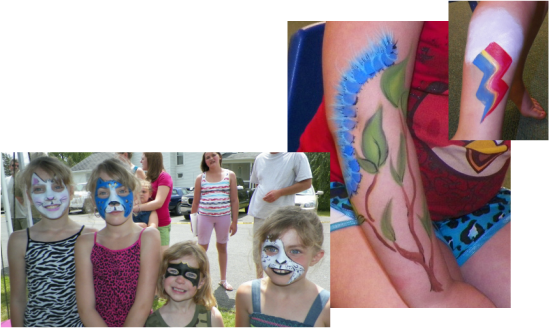 Of course, we also have glitter tattoos that are completely water-proof & great for summer fun parties. Now everyone can have a fancy-full beach or pool party this summer! 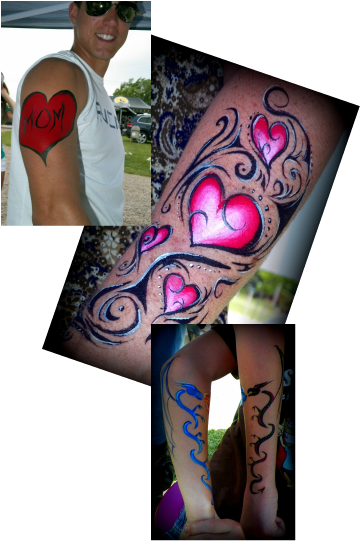 We are excited to paint and "tattoo" for Birthday Parties, Business grand openings, Work Picnics, School events, Sporting events, Plays & Productions as well as your neighborhood block parties, Reunions- you name it! Fanciful Faces now captures the beauty and wonder of pregnancy in a 3 dimensional piece of art made just for you. You choose a design that fits your own personal style with or without added dimensional features like ribbons or bows. Your cast can be done as a "belly bowl" with the inside of the cast being the main attraction & in which you can keep your baby's keepsakes. It can also be finished off as a 3-D piece of art, a true "belly bump cast" that you can keep as a unique nursery decoration or wall hanging. In one short sitting you will have your baby bump cast with 100% safe, non-toxic fabric mesh. The cast is usually dry within 45 minutes and you are able to go about your day as usual. I will keep the cast for up to 2 weeks to reinforce, paint, and embellish it to your custom order. 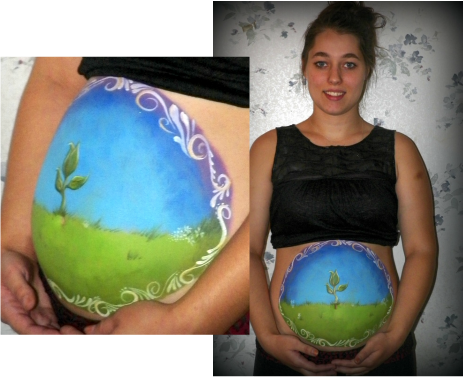 Some special things that just BEG for Fancy-filled painting. . . .
A beautiful way to memorialize one of the most beautiful experiences a mommy will have is a custom "bump painting" and photo shoot. You are encouraged to use your imagination, submit ideas based on your favorite children's books, your baby's nursery decorations or even simply some pretty pictures that you've found. As I am building my portfolio right now, the cost of a baby bump painting will include your photo shoot & digital copies of the pictures with unlimited usage permissions to print or share. School Spirit and Team Pride! Get ready for your next game, pep rally, school spirit day or graduation party with style! Individual bookings can be made for people who want to go the extra mile and show off their support for their school or team. I will paint faces, arms or legs... or all three! Prices if I travel to your home are $10 for the first face, $5 for each additional. If you come to me the cost is just $5 per face or design. Designs that are more detailed and take about 30-45 minutes to complete are also available if you really want to go all out! School or Kid's "Club" Events! 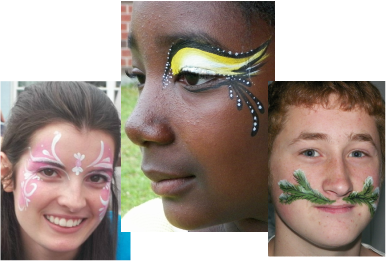 Face painting is a perfect addition to your kick-off party for school clubs or scout event. Standard designs can be used, or we can create a custom set of designs for your club or school! Often organizations such as these qualify for a special discounted rate! Call or email for more info. Please take a look at the "Special Rates & Discounts" page for more info. We are happy to work hand in hand with your organization to help raise funds for you. We have flexible options and competitive packages available to suit your needs. Because each individual fund raiser has its own goals and function, prices for reserving me or splitting proceeds will be determined on a case by case basis. Please take a look at the "Special Rates & Discounts" page for more info. OR--Are you going to a party and need to add an extra "oomph" to your costume? Contact me about an Individual Booking! 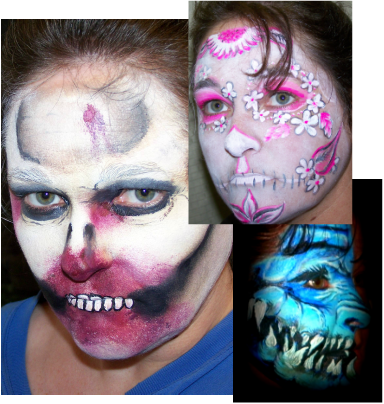 These designs are more detailed than your average face painting and they really can make your costume the talk of the town! I am happy to go to your location so that you are more comfortable for the session. Bring out your inner Princess, Punk or Phantom with some fancy-filled face painting on your big night! Corporate Events: Company Picnics, Grand Openings, Christmas Parties! 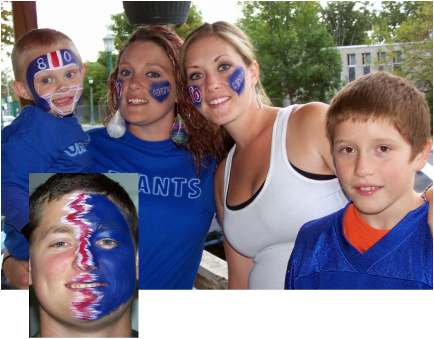 These are just a few of the events during which your company or club can offer face painting for employees, volunteers, patrons and supporters. 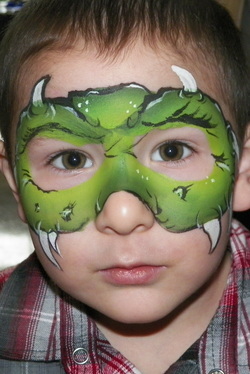 Special designs will be made for cheeks & arms with speed in mind so that a large amount of guests can get in on the fun. If you send images to me and consult with me in advance, I can also create CUSTOM designs just for your event! Check out the special pricing page to find the options that will work best for you!